Bulgaria’s Vratsa Municipality and the Romanian commune Dobrosloveni are going to apply together for trans-border cooperation funding under EU Program “INTERREG V-A Romania – Bulgaria", Vratsa Mayor Nikolay Ivanov has announced, as cited by local news site Kmeta. Earlier in 2015, Vratsa Municipality planned to seek funding for a similar project from the Bulgarian Ministry of Culture but apparently this plan has failed to materialize. Vratsa was visited last week by Dobrosloveni Mayor Gheorghe Tudorascu, and the local authorities from Bulgaria and Romania have agreed that their joint project will be called, “Ohoden, Vratsa Region – Dobrosloveni, Caracal Region: Bridge between Two Ages and Two Civilizations". The planned project budget is about EUR 6 million which will be divided equally by the Bulgarian and Romanian partners. The funding for Bulgaria will be used for a partial archaeological restoration of the prehistoric homes near Ohoden, and for promoting the site of what has been described as one of Europe’s earliest civilizations as a destination for cultural tourism. “Our idea is to set up an open-air museum on the excavated part of the archaeological site with all necessary facilities, infrastructure, buildings, and other means focusing on archaeology," Vratsa Mayor Nikolay Ivanov says. The project provides for “building" an experimental Early Neolithic village with five buildings using authentic prehistoric materials and technologies. The facilities will be used for the production of Early Neolithic ceramics, planting Einkorn wheat, making bread out of it, and production of household and cult artifacts out of bone, stone, and flint. The spiritual life of the Early Neolithic inhabitants of the site near Ohoden will be presented through reenactments of agricultural rites and funeral customs. Part of the funding will be used to set up a study center for experimental archaeology in the school building in Ohoden which will host training and student camps. The project of Vratsa Municipality also provides for continuing the archaeological excavations of the prehistoric settlement near Ohoden, and for setting up a camping and adventure park for tourists visiting the site. The Early Neolithic settlement near the town of Ohoden, Vratsa Municipality, in Northwest Bulgaria is one of the earliest human settlements in Europe dating back to the 6th millennium BC. It consists of prehistoric homes, a necropolis, and a fertility and sun temple. It features what might be the earliest known sun temple which is about 8,000 years old, as are the prehistoric human skeletons found there. The analysis of the artifacts found at the Ohoden Early Neolithic settlement shows that it belongs to the so called Gradeshnitsa-Karcha Early Neolithic Culture which developed in today’s Northwestern Bulgaria and Southwestern Romania. The finds from the Ohoden excavations indicate that the Balkan Peninsula was the center of a prehistoric civilization that spread to the rest of Europe. Back in 2011, the archaeologists excavating Ohoden discovered a sanctuary with a prehistoric altar decorated with huge trophy elk horns placed 2 meters away from the ritual burial of a man discovered in 2010. The scholars have stipulated that the altar was used to glorify the buried man’s hunting achievements. The sanctuary is believed to have been a fertility and son temple as its floor was paved with U-shaped stones directed to the east; it contained dozens of clay and stone disc symbolizing the sun disc, respectively the sun cult, in early agrarian societies. These finds that are unique of their kind in the entire world have led the scholars to hypothesize that it might be the world’s oldest temple dedicated to the sun. The first grave excavated at Ohoden was found in 2004. It belonged to a woman who was named with the Bulgarian female name “Todorka" by the local archaeologists. Todorka’s burial is exhibited in the Vratsa Regional Museum of History. Three more Early Neolithic graves have been discovered at Ohoden.The Early Neolithic homes whose remains were discovered at Ohoden showed traces of beams and columns 45 cm in diameter which is evidence of massive walls and roofs. 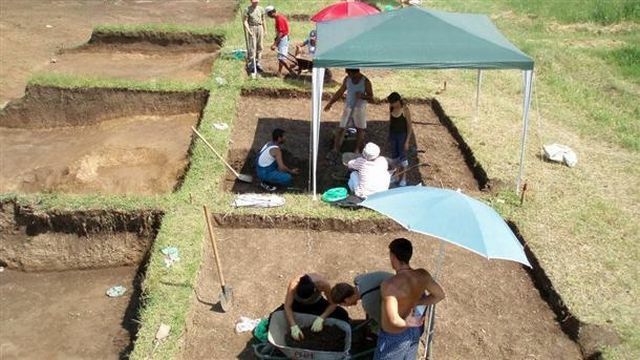 The 8,000-year-old Early Neolithic settlement in Ohoden in Northwest Bulgaria was first found in 2002. It has been excavated by a team of archaeologists from the Vratsa Regional Museum of History led by archaeologist Georgi Ganetsovski.